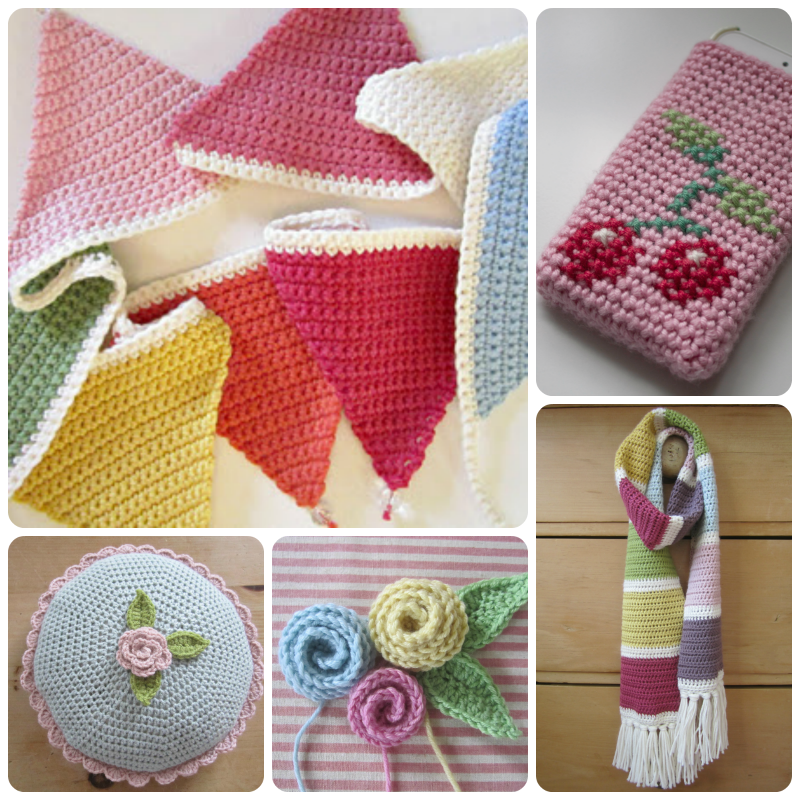 I just wanted to pop by and thank everyone who has entered my Absolutely Lovely Giveaway so far. I'm absolutely gobsmacked by how many of you there are! Blogging is a funny old business; you sort of forget people might actually be reading what you write. Thank you too for all the kind things you've said. I'm feeling terribly pink-cheeked and thrilled, believe me! I've been thoroughly enjoying reading all of your positive comments and have decided that perhaps January isn't so bad after all. Incidentally, just for the purpose of the giveaway and so that it is fully inclusive, I've changed my blog settings in order that anonymous users are able to leave a comment. Unfortunately, I will have to switch the filter back on when it closes as I have been inundated with some very dubious messages and offers! Don't forget, you have until this Friday, 5pm GMT. This has also been the perfect opportunity to share my anemones with you. They're my all time favourite flowers. I pounced on them in the supermarket yesterday. This happy tangle has been giving me so much pleasure. the anemone is beautiful! I didn't enter, as a non-crocheter (I'm not even sure if that's a word!) I didn't want to risk depriving someone else of that beautiful wool, but it was a very lovely giveaway indeed, and very kind of you! Pretty flowers and even prettier slippers! Beautiful flowers, they are really so cheerful. Gorgeous photos - especially that last one. It would look nice in watercolours - or just cheat and use the watercolour app! 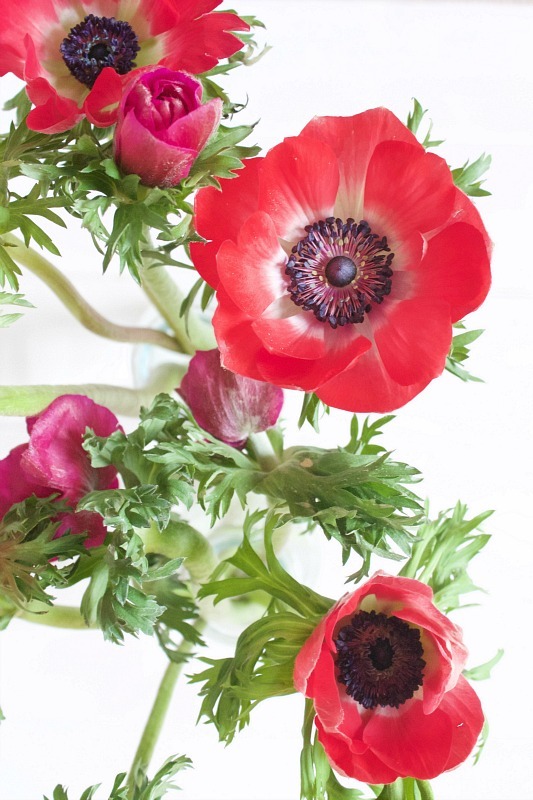 I love anemones and they were my grandmothers favourite flowers. I always miss them though as I don't know when to look for them. I shall see if I can find any as they are beautiful. We are definitely having a little more light, I noticed the other day. Soon be spring at this rate. 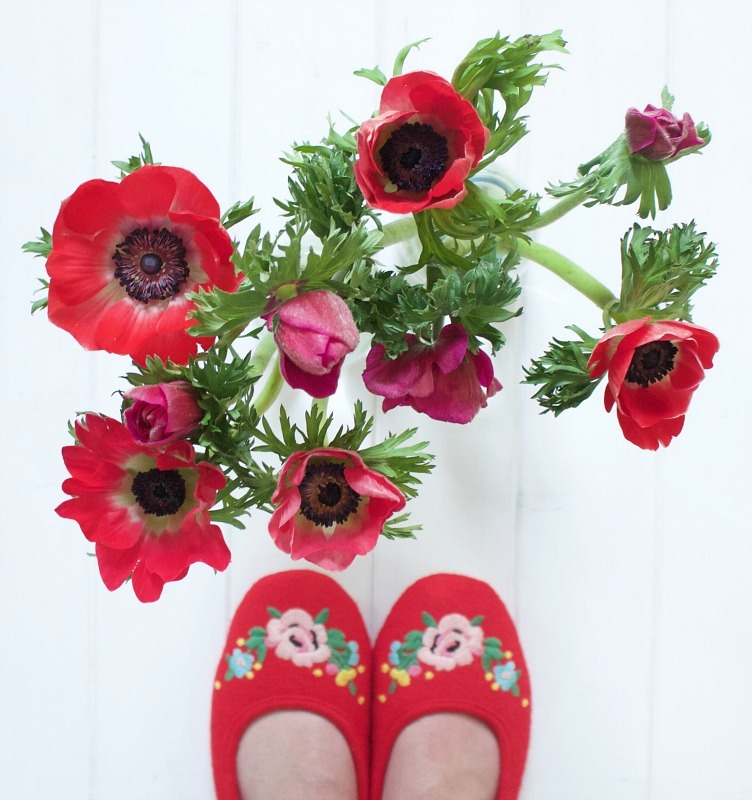 Beautiful flowers, great photos too - love those little slippers, did you make them? I'm another anonymous person who reads the blogs but sometimes have difficulties in leaving a comment, you are one of the blogs I read regularly and I really like the look of your blog and all your crochet makes, so even if I can't leave a comment I am visiting it, I hadn't realized that anemones were available as cut flowers, I've always known them for planting, maybe it's just not in the stores we have here on the west coast of Canada, Tory (torygadomski@ yahoo.ca) from B.C. 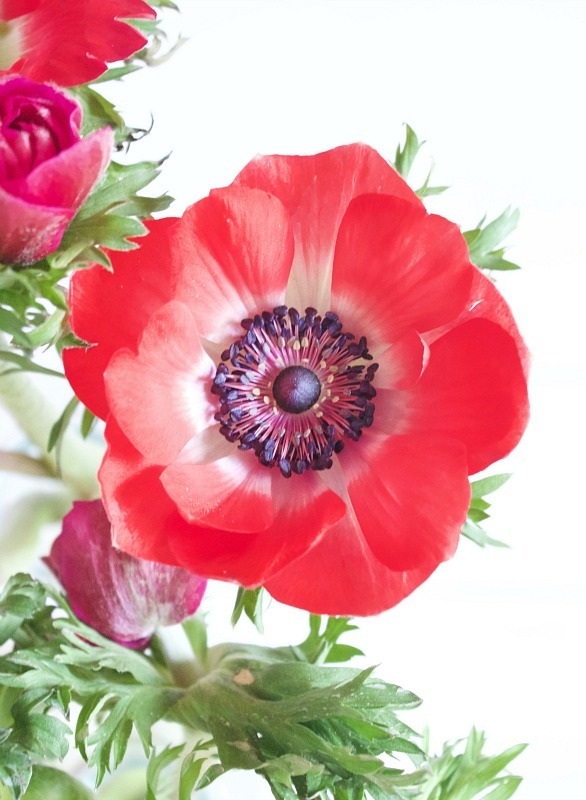 I love these pictures of your anemones!!! Como decia mi abuela, lo que se siembra, se cosecha. Y mi querida Sandra,ha cosechado mucho. Tu blog es pura inspiración,sus colores, las fotos , todo es bello! Mis cariñosos saludos desde Argentina! Hi, my name is Lisa and I'm your new follower. I like your stuff. You're an amazing blogger, I should say. Keep up! I'm waiting for some new posts from you!